Okay, so maybe I’m channeling some unrelated design frustration here. Last night I was struggling with a book design, and these cereals were the first book-shaped, designed-by-somebody objects that caught my eye this morning, so … well they had it coming. Idiot boxes. Tutting done, I’d better get back to work and get that cover finished. Actually, it wasn’t the cover that stumped me last night, it was the spine. It just wasn’t coming together quite how I wanted it to … and I think I actually managed to injure myself whilst working on it. Trying to typeset a few words at a right angle to the rest of the universe, I had my head tilted awkwardly to one side for far too long and now … is designer’s crick a thing? I definitely have designer’s crick. I always find this bit to be a peculiar challenge, mentally as well as physically. It tends to be tackled late in the process, the rest of the cover designed, debated and signed off before the publisher has figured out the precise girth of the book. When the magic measurement does arrive (invariably in headache-inducing fractional inches), it’s incredibly satisfying. The existence of a spine promises a physical manifestation for something that has so far only existed on screen. It is the reward of a third dimension. But doing that dimension justice is fiddly. The spine is the simplest distillation of the text: all you have is the title, maybe the author and publisher. It reduces the book to an entry in a great sideways list that spans the shelves of libraries and homes and bookshops. The spine must be functional yet distinctive; it demands a certain typographic purity that can easily end up looking generic. Despite all the attention lavished on the cover, it’s the spine that will be on display for the bulk of the book’s life (unless it lives in Amazon Books, the burgeoning real-world version of the online retailer, which retains the face-out, cover-is-everything approach). But you don’t see them being celebrated or revered in the same way as covers. Visual discourse is increasingly biased towards squarish rectangles, dictated by the dimensions of all of our screens and screens and screens. Tall and skinny, spines are an awkward shape: they don’t lend themselves to being shared or discussed or loved, unless they’re part of something bigger. One of a series perhaps, or as a repeated element in a regimented imprint. Or a shelfie. Spines just go about their business, unburdened by glory. Okay, so maybe I need to apologise to the cereal boxes. There are very few aesthetics that can be unintentionally yet accurately replicated, but there’s a house for sale near us that has – presumably in a bold effort to avoid dealing with estate agents – completely nailed the early nineties David Carson look. This could easily be a spread from Ray Gun or Blah Blah Blah. Just imagine what the paperwork for this sale will look like! 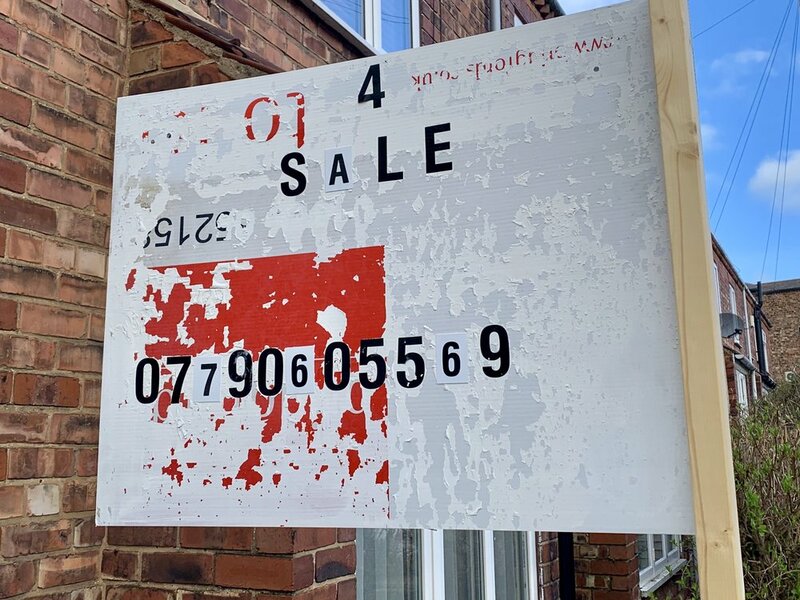 Presumably this guerilla approach to the property market will see … ahem … the end of fine print? I learned an awful lot about the history of art and design, even more about the construction of books and how things can be produced in multiples, the value of a single line, and absolutely zilch about business. I would not change a single thing. The relationship, value, and exploitation of the intersection between thinking and making. That there is a hidden arrow in the FedEx logo … that's all I truly remember, which is awful. However, I think that in terms of design it just gave me the space to explore my creativity alongside fellow creatives which is priceless. Design can’t be ‘completed’ in three years at Uni. We experimented, learnt from people willing to share. Failed, failed again & this will keep happening. Your idea is not original, it is what you do with it that brings it to life. The mac was a tool. Explore! I learnt that becoming an illustrator requires far too much effort … and that before you're allowed to start any project you need to fill eight sketchbooks with research. Critical thinking, how to critique your own work, understanding and implementing feedback from peers and tutors, semiotics, and always use a spraybooth if you are using SprayMount. The importance of ideas. The role of a designer in culture / society. The ethical significance and power of design for good/ill. The techniques and tricks to grab attention, to confuse, to communicate etc. The importance of group crits and sharing. Also, Foosball. University lacked knowledge, real life experiences and learning about potential business problems. How to go around winning new business, invoice, chasing clients, brand promotion have been things I've learnt the hard way since graduating. Seemed too relaxed. DO NOT paint your face with cadmium red oil paint. They taught me to learn and keep learning. To study current and past design solutions and techniques. Study the masters and what made them tick. To observe current trends. My teachers weren't extraordinary designers or business managers, but I value what they gave me in four years. That in countries where secondary education is very STEM focussed (looking at you, Deutschland), having the time to slow-poke your way into creative thought structure at a Dutch design academy can be invaluable for the rest of your life in design and beyond. Art school basically taught me this. How to learn. And that a career in design is about constant learning (and unlearning). It seems to be an equal balance of lessons in the philosophical, practical, social and redundant. Pretty much in line with my own experience, just a few subjects over. Anyway, thank you to everyone who responded! The thread is still open if you want to add your own experience. Hopefully it will all be of some use to educators and prospective students wondering what they’re letting themselves in for.